Conductor Jessica Cottis has recorded a symphony commemorating the centenary of a campaign that brought together three nations. Europe marked 2014 as the centenary of the outbreak of the first world war. For Australia, New Zealand and Turkey it was last year’s anniversary of the Gallipoli campaign that had deeper resonance. 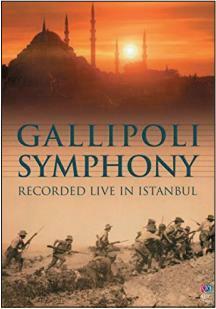 In the culmination of ten years’ planning, the Gallipoli Symphony – bringing together works by 11 composers and performers from all three countries – was premiered at Istanbul’s Hagia Irene last August and performed in Queensland in November. A DVD of the first performance is now released on ABC Classics. Working with film producer Des Power, whose brainchild the audiovisual performance was, has been 36-year-old Australian/Scottish conductor Jessica Cottis. The orchestra includes Turkish instruments, an Aboriginal didgeridoo and Maori instruments. ‘There is something incredibly powerful in bringing together the musical styles of these three countries and their performers,’ Cottis says. The video fuses archive footage of the first world war with scenes from the premiere in Istanbul. Cottis says both performances have received standing ovations and, in response to demand, ABC Classics is also preparing an audio-only recording. The project marks the end of a hectic period of globe-trotting for Cottis with two years as assistant conductor at the Sydney Symphony Orchestra where she remains a guest conductor, work with other Australian orchestras alongside BBC orchestras and the Royal Conservatoire of Scotland. Her initial career as an organist was ended by a wrist injury and she began studying law ‘but realised I couldn’t live without music’. Original story appeared in the February 2016 issue of Classical Music Magazine. Article written by Phillip Sommerich.